After I adjust a photo, say make modifications to the white balance and tone, I export the photo. If I re-open it using PD9 and go to the 'adjustment' tab everything is reset to zeros and it shows "as shot" in white balance. Is there any way to save the last adjustments that had been made to the photo in PD9? Also, if I'm working on a photo and have it part of my library, I can exit the program and come back and any adjustments (i.e. move exposure to 0.75, or contrast to 20) I have made in the global adjustment tool are still set. However, if I take this photo and save it to a site like Flickr (which I use for photo storage) and then download the photo back into PD9, the last adjustments are gone - everything is back to zero, even the tags don't save unless you export the photo but then you have the problem noted in the first paragraph. The PhD Project is just a database (SQLite) with information about your settings in it. It is just a kind of 'cookbook' with the recipe of the pictures alteration. While exporting the 'recipe' works on the exported picture. If you load the exported picture, for PhD it is a new picture. Knowing that and the above, you see now, why the settings are all zero. 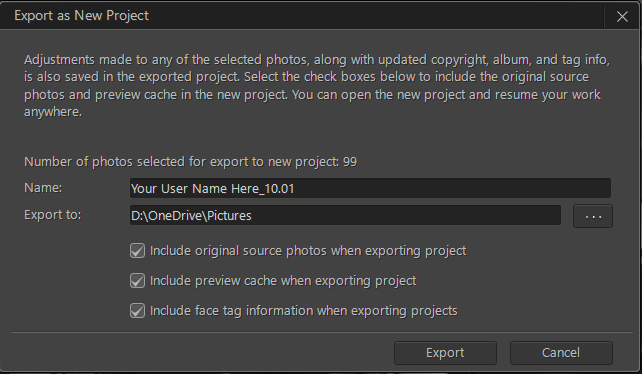 If you upload an exported picture to internet and reimport it to the project, the picture is also new to the project. Ergo, all settings zero again. PhD does not offer a way to store the settings in an external file. Other programs do that in a proprietary file format, like PSD (Photoshop), PLD (Photoline), XCF (Gimp), etc. PhD does not use such a file format. if you import a picture into a PhD project and think "It's in the project, I can delete the picture from my harddisk", you will lose your picture. It is not in the project. In the project, there is only the information, where the picture is on your harddisk. If you lose your project file, all pictures are still there, but all the settings you did for the pictures are lost. So do backups. Thank you, your 'recipe' analogy was helpful. I just wish you could store or save that recipe for each photo somehow so you know how you mixed it up the first time in case you found that you just needed a little more sugar and a bit less salt, but all the other ingredients were just right. Quote Thank you, your 'recipe' analogy was helpful. I just wish you could store or save that recipe for each photo somehow so you know how you mixed it up the first time in case you found that you just needed a little more sugar and a bit less salt, but all the other ingredients were just right. Then if you want to enjoy it again, you'll be able to make it exactly as before, or tweak the ingredients or steps as needed. Be sure to serve it warm! Excellent contributions by Hatti & optodata. Nothing I could add would improve the recipe.